For many northern gardeners, the recent bouts with frost have come too soon. I don’t want to say good-bye to my flowers yet, and I have dozens of green tomatoes still on the vine. When a light frost struck the garden last night, I decided it was time to take action. The most recent issue of Northern Gardener has an article about ways to stretch the vegetable gardening season. One of the tips was to hang tomato plants upside down to harvest more tomatoes. So, instead of picking each tomato and wrapping it in newspaper, I yanked out several plants by the roots. The article, written by author and blogger Colleen Vanderlinden, suggests hanging the tomato plants in the basement or garage. I was a bit concerned about the mess with that idea, so instead, I hung them on a drying rack we normally use for clothes on our back patio. I’ll cover the rack at night with a blanket or plastic sheet and put it close to the house to keep it cozy. Three huge tomato plants hanging from a drying rack in hopes of getting ripe. 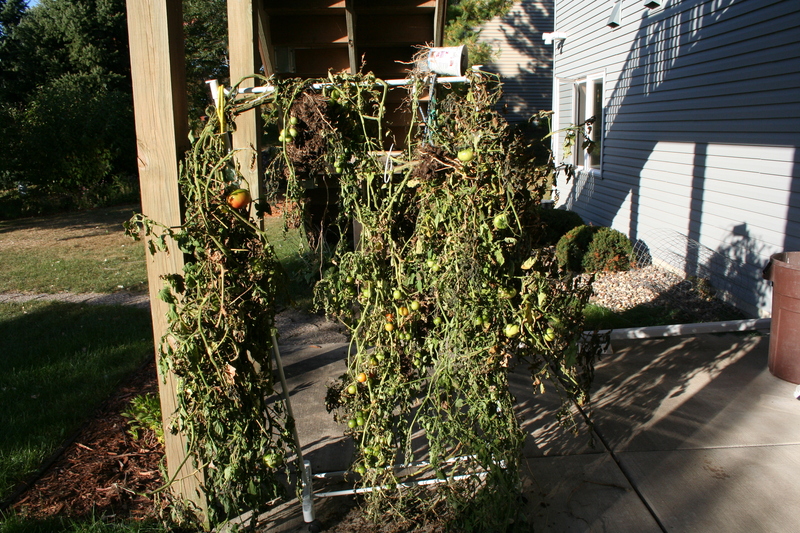 Not pretty, but I am getting tomatoes to ripen. 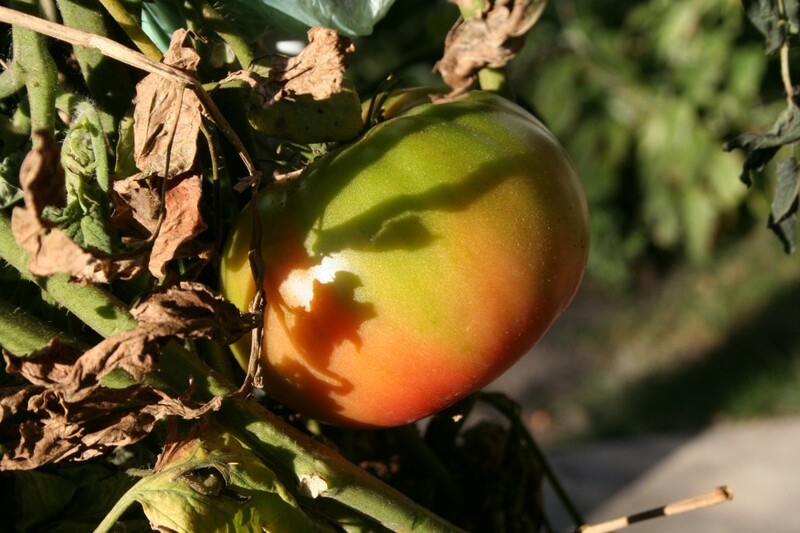 According to the article, the tomatoes will ripen gradually and you can pick them over several weeks. Of course, with their roots out of the ground, the plants will eventually shrivel. At that point, I will harvest any remaining fruits and put the rest of the plant in the compost pile. I’ve never heard of this idea before, but it sounds like a great way to extend the vegetable season. What are you doing to extend the harvest season this year?